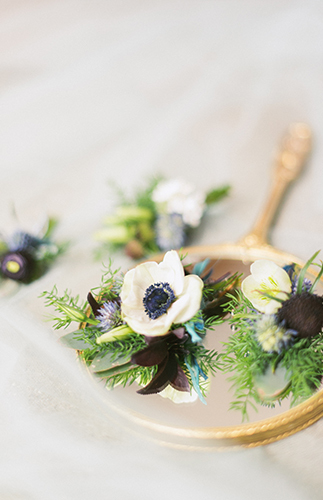 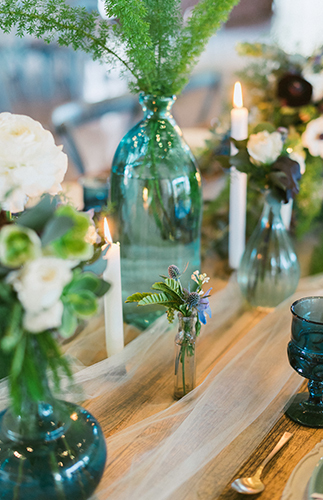 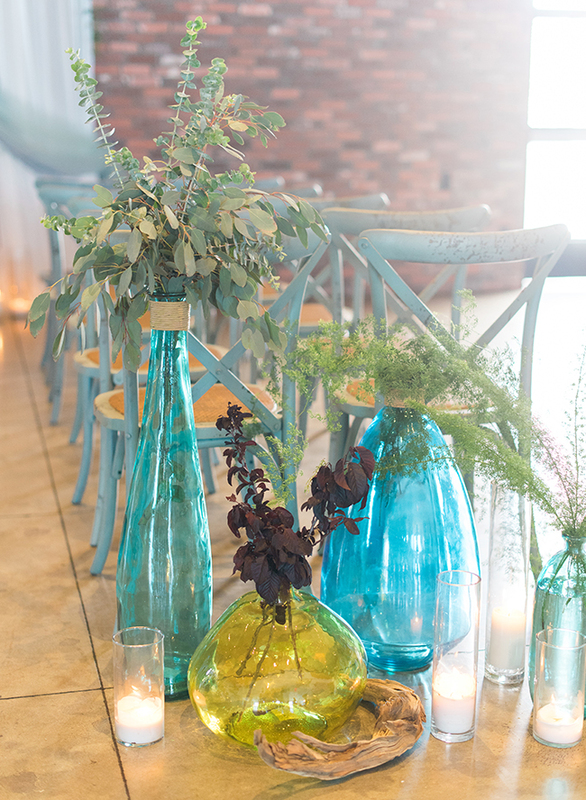 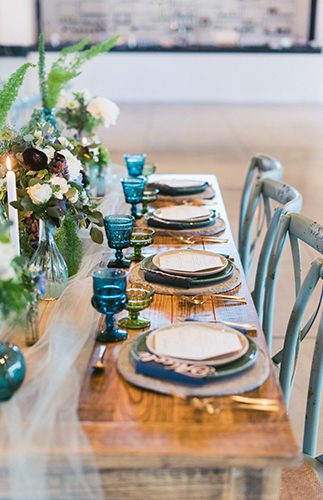 This green and blue winter wedding inspiration embodies a winter spent by the sea. 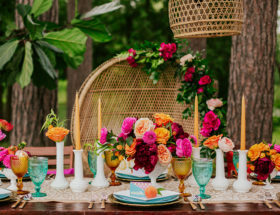 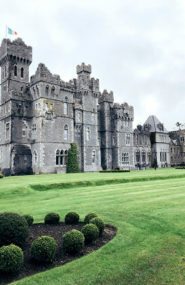 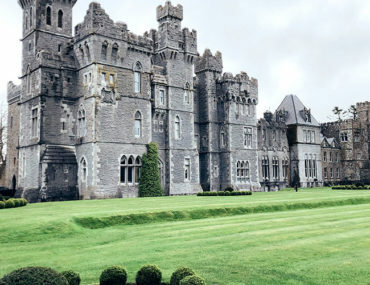 The beautiful color pallete reflects the theme, as does every detail and decoration. 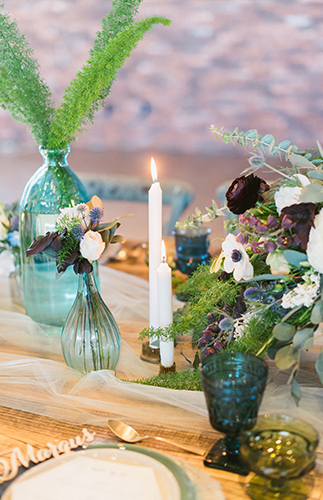 We love the gorgeous combination! 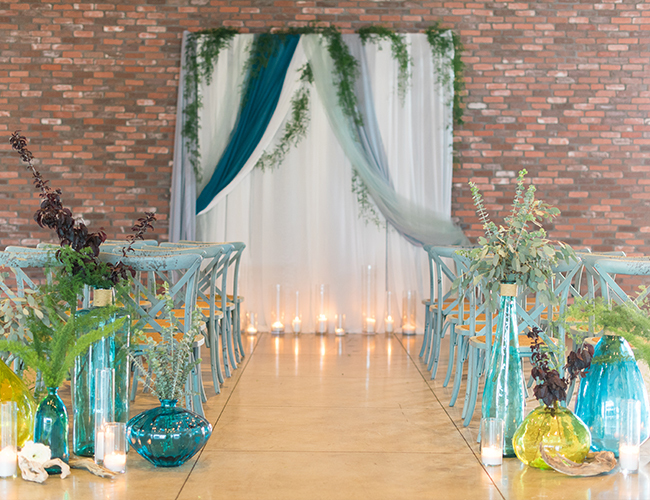 Deanna Nash of Deanna Nash Events describes it saying, “We joined the water-colored hues of the sea with an industrial background to create a fun wedding that could be re-imagined in any setting.” Wether you are planning for the perfect summer day or a wintery white & blue wonderland, you will find inspiration in droves. 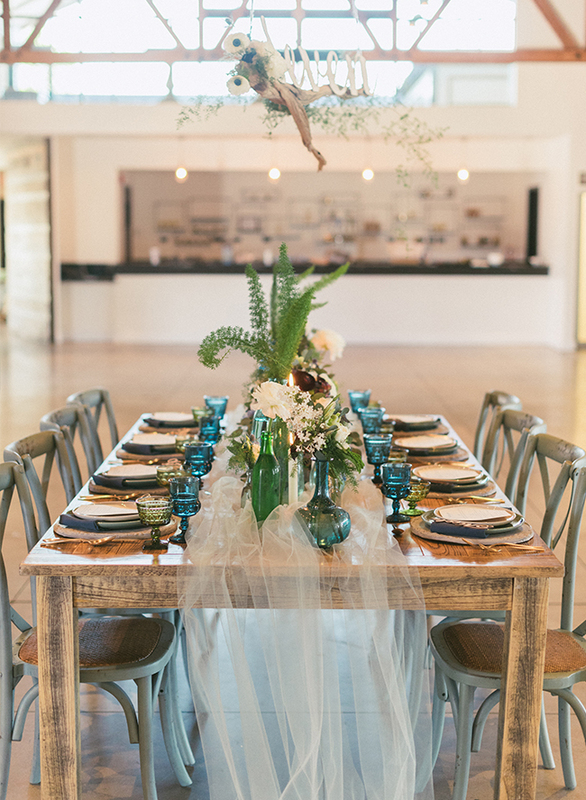 We layered a table resembling driftwood with beautiful tabletop items. 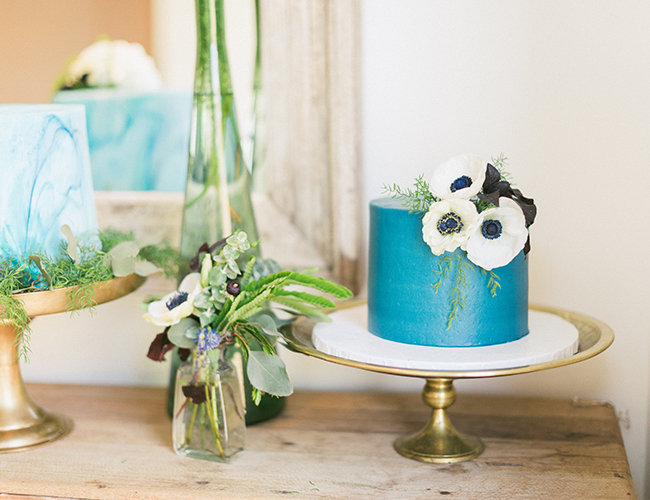 The shades ranged from cerulean to the smokiest of blues. 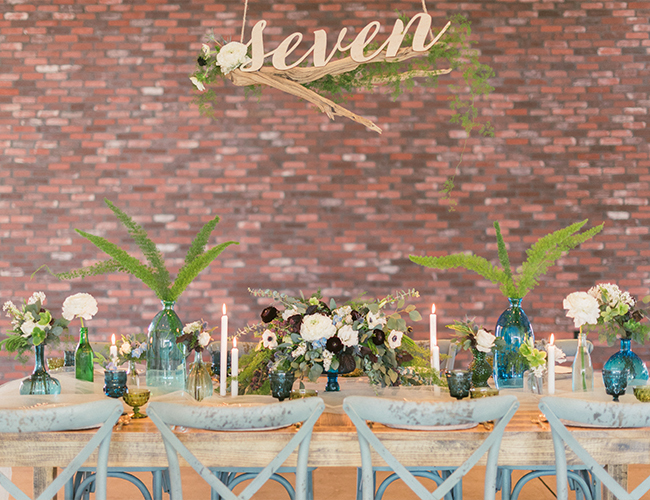 Concrete chargers created a base for our tableware. 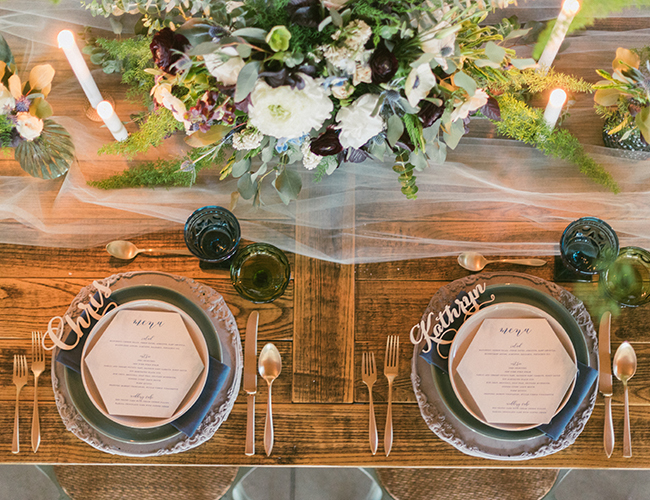 They were topped off with custom laser-cut names in raw wood to guide guests to their seats. 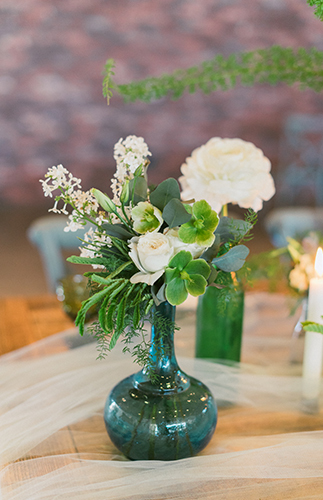 Layers of greenery with pops of white rounded out the table in the form of centerpieces across the tabletop. 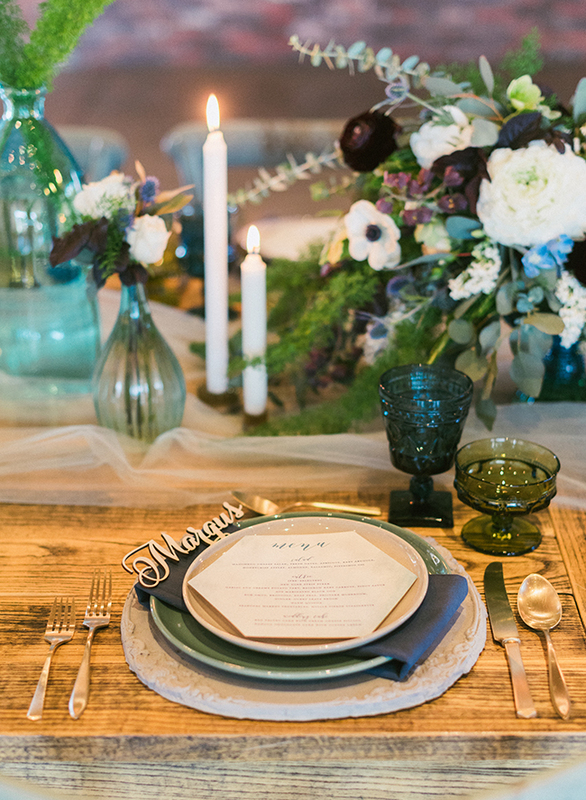 To add a little sparkle to the table, we used gold flatware and brass candlesticks to finish the look. 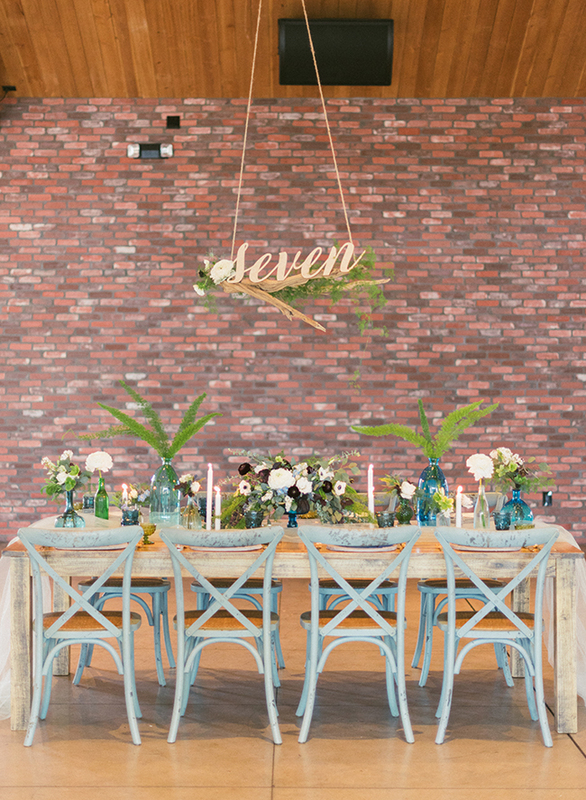 Table numbers were laser-cut and mounted to driftwood that floated above the table. 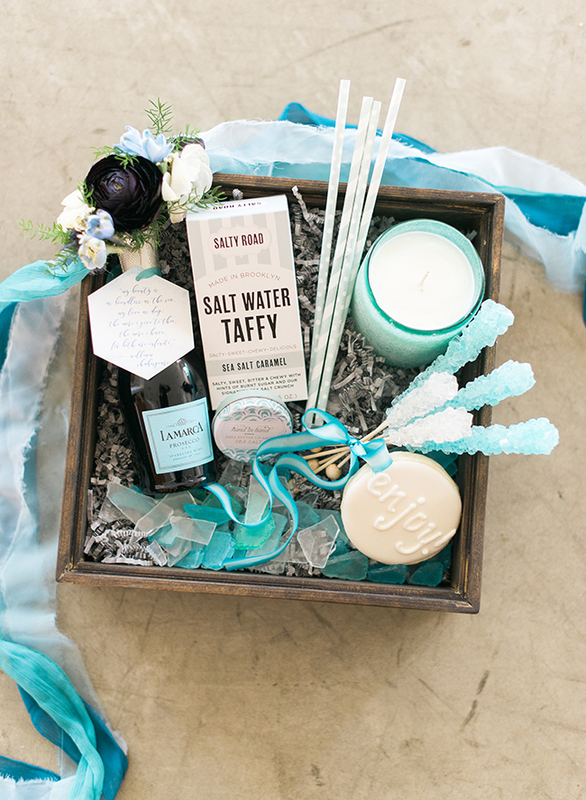 Guests were welcomed to their hotel with a custom gift box filled with items inspired by the sea. 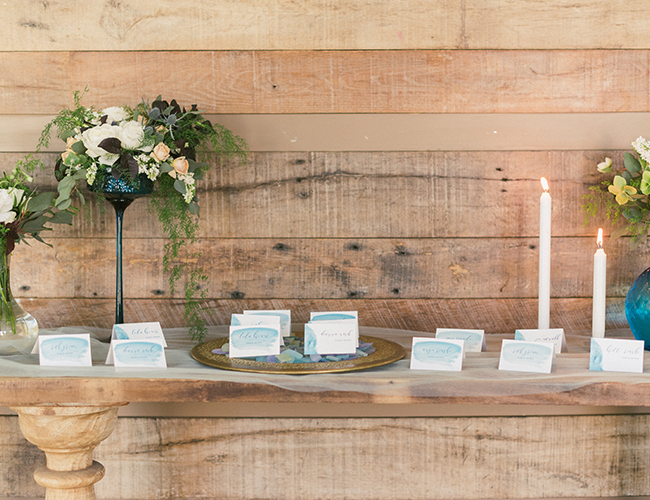 The box included  saltwater taffy, sea glass, and sea salt lip balm to name, just a few. 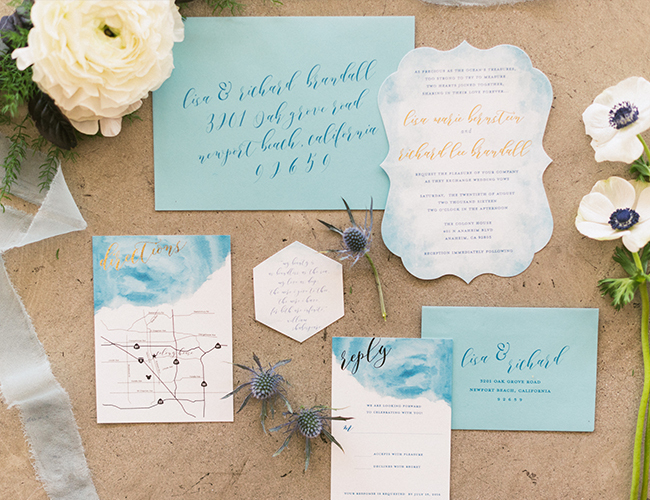 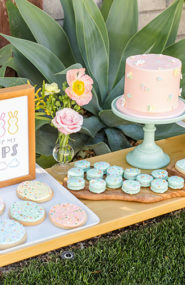 The invitations and paper goods are also in water-colored hues. 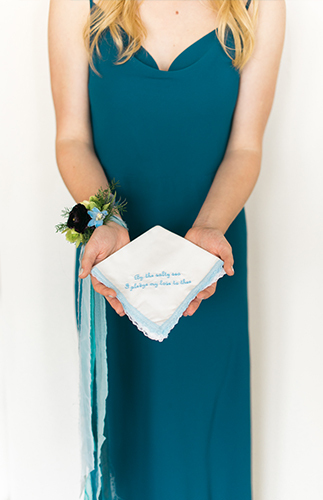 The bridesmaids and groomsmen carried custom handkerchiefs embroidered with sea-inspired words of love. 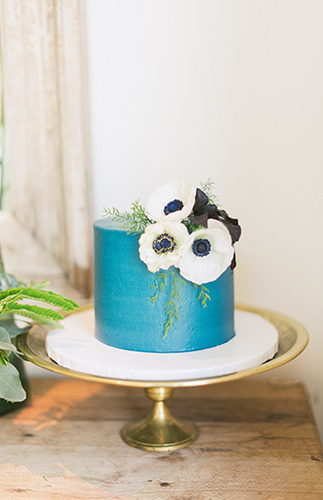 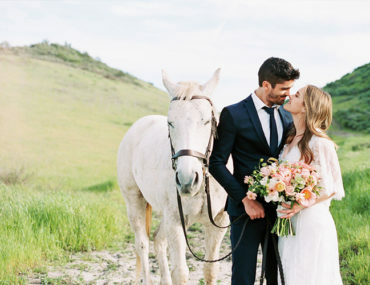 As a nod to her favorite color, the bride wore a dress in the palest shade of blue. 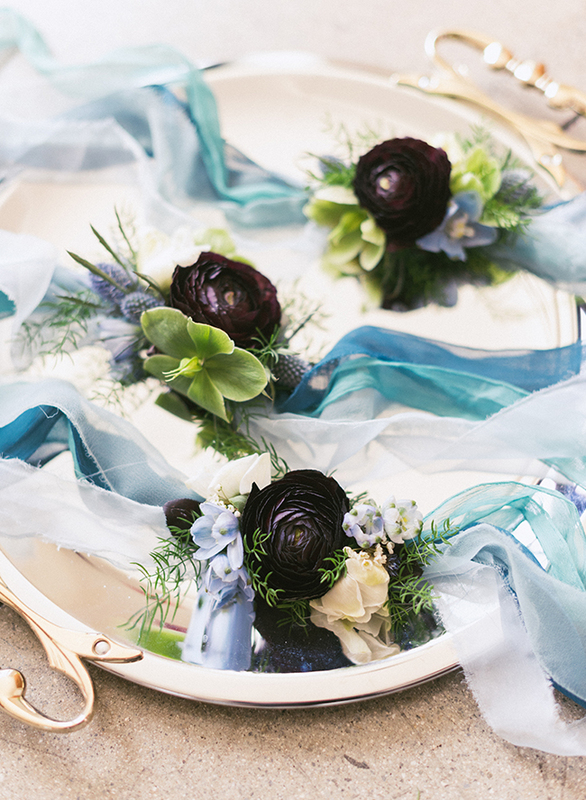 Meanwhile the bridesmaids wore the blue of the deepest of seas. 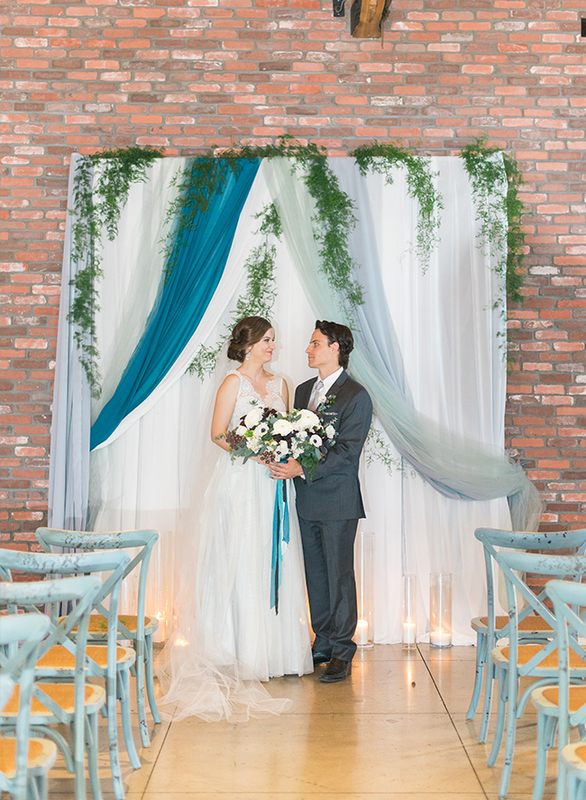 The ceremony background, with its swaths of fabric, was meant to evoke the movement of the sea. 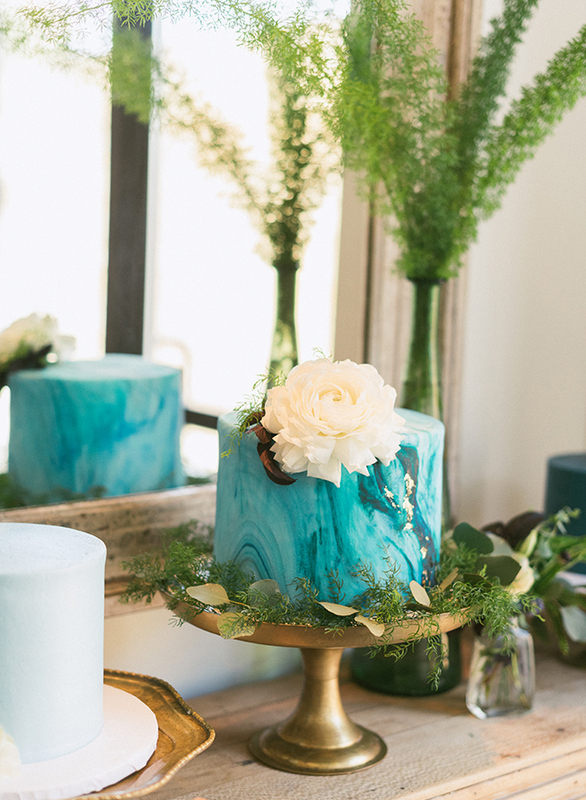 To end our day on the sweetest of notes, three cakes in different shades of blue were displayed on brass pedestals and complimented by an amazing array of florals. 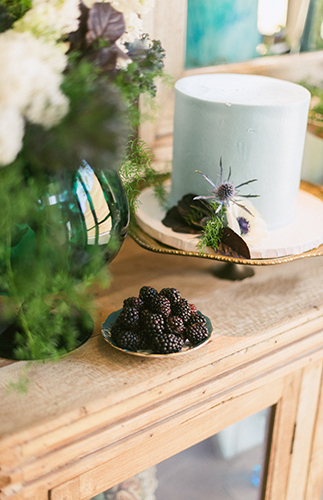 Dessert: Great Dane Baking Co. 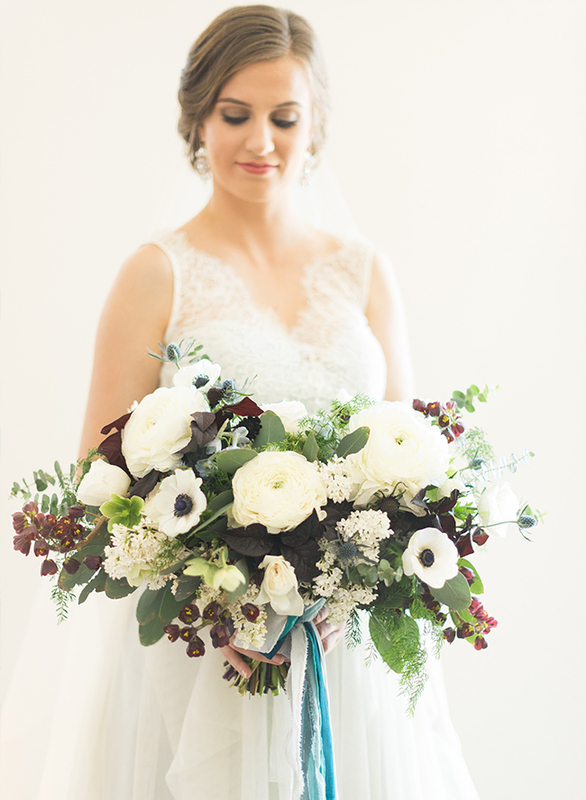 Thank you for sharing this beautiful winter styled shoot!